The National Capital Area (NCA) chapter was established in 2005 and celebrated its tenth anniversary in 2015. GPA-NCA represents grant professionals in the Greater Washington, DC metropolitan area and is a proud member of the national Grant Professionals Association (GPA). GPA-NCA supports its members through education, networking, volunteering, and pursuit of certification. The GPA was founded in 1998 as the first organization to promote grantsmanship as a profession. Currently, the GPA is over 2,000 members strong, with over 40 chapters around the country. If you are interested in serving as an officer or committee chair, please read more here contact us at grantsnca@gmail.com. The idea for the National Capital Area chapter came out of the 2004 GPA (then called the American Association of Grant Professionals) conference in Boston. During that meeting, three new GPA members from the DC area – Ruth Wrenn, Myra McGinnis, and Teri Blandon – became committed to launching a chapter for the Washington, DC area, to enable other grant professionals to experience the same power of networking, education, and information-sharing as at the Boston conference. ​The chapter was launched on April 20, 2005, with the Application for Chapter Charter signed by the following officers and founding members: Myra McGinnis (President), Octavia Caldwell (Vice President), Deanna Ackerman (Secretary), Laura Feldman (Treasurer), Teri Blandon, Loretto McNally, Ruth Wrenn, Susan Messina, Kathleen Eng, Clare Feinson, Robert Graham, and Donald Whitehead. The application was signed by then-GPA President Phyl Renninger in April 2005, then approved and made official in May 2005. Only two years into its active chapter status, the GPA-NCA planned and hosted the 2007 GPA Annual Conference at the Crystal Gateway Marriott in Arlington, VA, with 494 attendees. Immediately following the conference was the first GPC exam. Our chapter has also actively participated in the GPA organization at large, serving numerous committees, presenting workshops and writing articles for GPA publications. Our chapter continues to grow quickly. 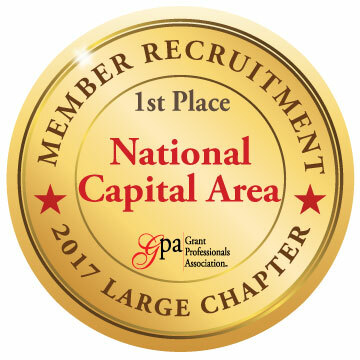 In 2017, the GPA-NCA chapter achieved first place in GPA's Chapter Performance Rewards program, recruiting 45 new members throughout the year. We also achieved third place in the retention category, boasting an 84% retention rate.